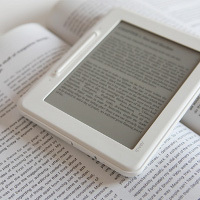 Are e-book readers going the way of high definition? That certainly looks like it, if the naming convention of the iriver Story HD ebook reader is anything to go by. Well, this is meant to help you pass time through long flights as well as other moments of commute, where it also holds the distinction of bringing yet another first to the world – we’re talking about it being the first 6” XGA resolution (that’s 768 x 1024 pixels) e-book reader worldwide, sporting 63.8% more pixels and faster page turns compared to other models in its class. To know more about this little puppy, you will have to read on in the extended post. The iriver Story HD is touted to deliver outstanding legibility with crisp fonts, fast response and high performance courtesy of an advanced i.MX508 eReader applications processor from Freescale Semiconductor that is based on ARM CortexTM technology. Of course, we are also interested to see how it will fare against the Mirasol display from Qualcomm, which frankly at their CES booth this year, looked pretty stunning even under direct sunlight. What’s the whole point of having great hardware without the relevant software? This is where its integrated Wi-Fi connectivity comes in, where the e-book will be able to access content through the major content partner. As for which content partner will be available, that remains to be seen since it depends on where the iriver Story HD is going to debut. Boasting iriver’s slim and lightweight signatures when it comes to form factor, you will also benefit from a QWERTY keypad, accompanied by a curve with two-tone colors at the front and back for easy grip and slim design. The Story HD will also not come up short where buttons are concerned, where they are located from the side to the center of the keypad, boasting an up/down layout instead of the right/left design that allows the unit to be more user friendly compared to other e-book readers in the market. iriver touts a 3-week battery life with the Story HD, although that remains to be seen whether it is left on all the time, or put in standby mode – guess we will need to have access to it before we are able to come up with a conclusion, eh? Supported formats include Adobe EPUB and PDF with DRM. No idea on pricing, but it will be competitive amongst its peers as it makes an appearance in the second quarter of this year.